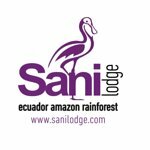 Sani Lodge is located in the intermediate corridor of Yasuní National Park and Cuyabeno Reserve, this place is owned by Sani Isla Kichwa Community and embraces a total of 42,000 hectares (103,784 acres) of virgin rainforest. This is an exclusive Eco-hotel that welcomes to the tourists with an astonishing biodiversity. Part of the attractions is the trek through the forest, where you will be surrounded by 1,500 species of trees, hundreds of lianas and beautiful flowers; 550 species of tropical birds, 13 species of monkeys and 1,000 species of butterflies. SaniLodge is attended by It´s owners all the time, so profits stays in the community and it helps to improve in healthcare, education, &amp; sustainable projects! This in fact, will guarantee that all the visitors have a Real Cultural Experience with the 600 people of the Community. If you're thinking of traveling on your vacation. Sani Lodge is your choice. your second home awaits you within the dense Ecuadorian Amazon rainforest. All cabins are built with typical woods of the area, with large openings window protected by mosquito nets, roofs with toquilla straw. These facilities are in harmony with the jungle and will allow to live an unforgettable dream.